Colorado RV Dealer serving Greeley and Denver with New and Used Travel Trailers, Fifth Wheels, Campers, Toy Haulers and Hybrids for sale in Colorado and Wyoming. 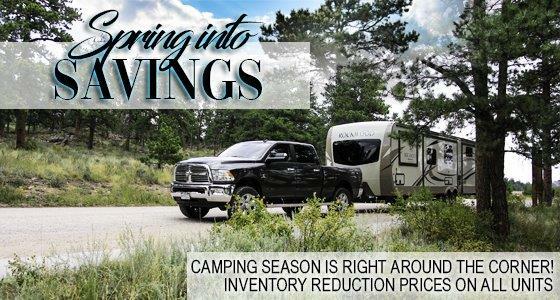 Colorado RV dealer offering New & Used RVs, Fifth Wheels, Travel Trailers, Toy Haulers, Expandable, and Pop up Campers for sale. Colorado RV Sales in Evans, CO serving Greeley, Loveland, Fort Collins and Denver. When you browse our selection of new & used RV’s and campers at our Colorado RV Dealership in Evans, Colorado, we are confident you will find the one that is right for you. At The Great Outdoors RV our focus on customer satisfaction is unparalleled; our sales consultants will do everything they can to ensure that our customers are always 100% satisfied with their purchase. We are dedicated to building long term customer relationships based on mutual trust and respect not only during the initial sale, but for many years to come. Colorado RV Service and Parts in Evans, CO serving Greeley, Loveland, Fort Collins and Denver. Looking for an excellent selection of RV parts and RV and camper accessories in Evans, CO and the surrounding areas as well as top notch hassle-free service? The Great Outdoors RV has that too! We can handle virtually every RV Service need, whether big or small, and are capable of diagnosing and repairing your RV or camper quickly and efficiently. Our Colorado RV and camper service prices are always very reasonable and our team of Colorado RV service experts are always ready to tackle any new challenge with a friendly, helpful attitude.